In May 2016, Philadelphia Union were riding a stellar defensive record to the top of the Eastern Conference. One year later, they entered May leaking goals and staring up at their rivals, dazed, from the bottom of the east. Fans who had reinvested time and money in the club after the lengthy spiral that ended when Earnie Stewart replaced Nick Sakiewicz atop the Union org chart were restless. Stewart came with a proven track record of squeezing on-field success out of limited funds, but his offseason acquisitions were either struggling to get in the lineup or looking talented but problematic defensively. Placing the blame on Stewart is uncomfortable for a number of reasons. First, he has always touted a long-term vision and remains relatively new to the job. Second, the specter of Nick Sakiewicz and his chaotic approach to roster management remains fresh in the mind. Third, Stewart is an acolyte of the “Moneyball” family of strategies that argue they can achieve the same goals as other clubs but for a lower financial cost. Instead of hitting the market and trading dollars for players, the return on money spent can be increased by investing it in innovative ways that allow value undetected by competitors to be uncovered. 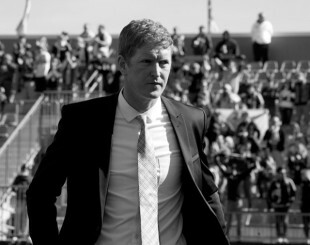 With Stewart well (and rightly, given his short tenure) insulated, blame for the Union’s recent winless run largely fell on head coach Jim Curtin. Unlike his sporting director, Curtin cannot point to a lengthy track record of success in a European league. And while few can question that he performed admirably in his original role guiding the club through a tumultuous and somewhat rudderless period, it is fair to ask whether he is truly the right candidate to enact the new prerogative: Build a foundation for long-term success. A team of expensive stars is more tactically forgiving than one without. Though obvious and perhaps cliche, this statement communicates an important assumption: Talent can hide tactical laxity. Thus, Argentina can feel more comfortable letting Diego Maradona — a great player but highly suspect tactician — lead them into the World Cup when the only Argentinian better than Maradona with a soccer ball is starting up front. Philadelphia Union do not have a Lionel Messi to paint over a manager’s tactical shortcomings with brushstrokes of near-impossible genius. Teams that are regularly outspent can’t just be smarter in the front office. They must also find more value in how they approach each game and adjust within it. The coaching staff, then, should be a source of advantage when measured against other clubs. Curtin took over the Union in the summer of 2014. Since that time, the club has appeared in two U.S. Open Cup finals, losing in extra time and on penalties to favored opponents. They made — or slouched into — the playoffs in one of his two seasons, and navigated an absurd goalkeeping situation to produce a MLS Goalkeeper of the Year. Each season Curtin has been in charge, the team has lost — through injuries, trades, personal issues, or simply a desire to return home — at least two key midfielders. Their international recruitment has been, at best, a mixed bag, and they have relied heavily on the draft even as other clubs have begun to treat it as a more developmentally-oriented event. None of this is meant to exonerate the head coach from the faults many find with him (a plethora of which have made their way into both the articles and comments on this website). Instead, recognizing the chaotic situation that has, until recently, often defined the Union means that it is likely quite difficult to separate the effect of the chaos from the effect of the coach, particularly when that coach has a relatively short track record. But when the Union faceplanted out of the gate and threw away a three-goal lead at home, it finally appeared to provide clarity. Alejandro Bedoya exerted minimal influence from the attacking midfield role while new signing Haris Medunjanin, dubbed a “controlling midfielder” by Stewart, seemed incapable of controlling opposition attacks. Keegan Rosenberry, Chris Pontius, and Richie Marquez regressed; Ilsinho remained anonymous in the final third. Curtin couldn’t cut it. Three wins and four shutouts later, however, and suddenly Philly’s head coach seems to have found the answers. Can Jim Curtin’s management provide the extra value Philly needs from its coaching staff to compete in MLS? Perhaps the best way to peek into Curtin’s development as a tactician is to find out exactly how his broad coaching philosophy has evolved, and how that has influenced his tactical and personnel decisions this season. As he did last year when he spoke with PSP, Curtin invoked Mauricio Pochettino at Tottenham Hotspurs as an influence. “Pochettino, everyone thinks he has this open style, but he’s defense-first,” Curtin said. “They don’t give up anything. If I could mold myself and take a little bit from each coach: He’d be the one where I’d say: This is what my ambition is for Philadelphia Union. Similar 4-2-3-1. Can it look different once in a while, where they do play three in the back and can juggle it — I actually think we have the personnel to evolve to that sophistication. One of Curtin’s best attributes as Union head man has been that he treats the constraints of Philly’s situation as beyond his control, which means he doesn’t brace against them but instead sees them for what they are. The Union are not going to spend that kind of money any time soon. And while that can be deflating for fans, succeeding in spite of that is what makes the Moneyball approach so intriguing in theory. The problem thus far is that, despite making the playoffs last season, calling the Union a success would garner more incredulity than support. This is likely why Earnie Stewart explained to fans last week that he was still working to understand what they had been through as supporters before he arrived. Stewart also said “it really pisses me off” when Curtin is booed, because he believes the boo-birds don’t understand what it takes to implement tactical concepts and get players to follow them. Some fans might respond: What concepts? Every week we see the same 4-2-3-1. The team shape has, in fact, become a point of some contention. But the focus on the shape entirely ignores a key issue: By signing Haris Medunjanin, Philly was never going to come out and try to play the same high pressing 4-2-3-1 they hoped to execute last season. Medunjanin may be (a bit) more mobile than given credit for, but his inclusion was a clear signal the Union would not simply try to replace Tranquillo Barnetta with more energy. The 2017 Union may look the same from the air, but a similarity in shape masks a far different tactical approach than before. “Obviously, losing Tranquillo changes a lot as to the type of playmaker that you have,” Curtin said. “Tranquillo is a guy that did it by volume, getting on the ball over and over again, and he can get goals and assists, but also did a lot of work defensively in that 10 spot. So losing that was obviously a big loss. “And then you look at the kind of personnel that we had. Obviously Mo Edu, big question marks in terms of where he was at. Brian Carroll, Warren Creavalle, and Derrick Jones coming up, so you think of those four guys and their skill set, all were predominantly, you’d say, good ball-winners, and experienced ball-winners — with the exception of Jonesy — guys that are more about athleticism and breaking up plays. So we wanted to add someone — and you also factor in that you lose a ‘Quillo — someone that had the ability to look different. “The other guys can all pass, but they aren’t really necessarily guys that play a final ball. And the way we wanted to set it up, it is a little different, it’s almost inverted, in that you have kind of a playmaking deep-lying guy, a little different look at it. 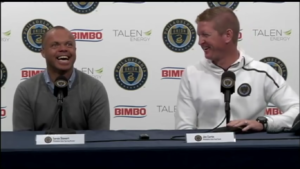 “When we lost Josh Yaro in preseason, that was kind of critical,” Curtin continued. “He has better feet than people realize and he also gave us that speed at the back that could win the ball quickly and give it to Haris. So we lost a little of that, and there’s been some juggling. But overall, the thinking was: How do we start our attack a little differently? Who is a guy that wants the ball in tight spots? “Haris doesn’t beat you with stepovers and tricks. He does it with just little, subtle movements of his hips, will make the entire defense shift the wrong way, and then he can play a 40-50 yard ball on the ground or in the air and put it where he wants. There’s a ball from this weekend [against D.C. United] that comes over his shoulder and he actually hits it off a half-volley and actually hits a through ball to C.J., and you’re just going, ‘Holy [crap].’ Not many people even realize what he just did, but that’s hard to do. People have indeed said this, and Curtin is right that changing the shape is often considered nearly synonymous with making tactical adjustments. Additionally, the perception of stubbornness is exacerbated when a team goes 16 matches without a win and continues to insist the shape isn’t an issue. In large part, though, the notion that Curtin was too stubborn or inexperienced to make the right adjustments may have come from the unavoidable fact that subtler changes are more difficult to notice and rarely explicated publicly. So what are the more nuanced tweaks Philly has made that have finally begun to pay off? 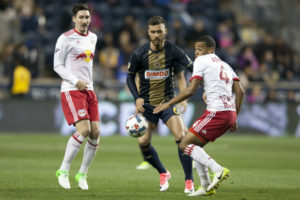 “Our outside backs now, especially against Red Bull, their cue is: As soon as it goes wide, that’s when Wright-Phillips cuts it off and their wingers [are] flying at the outside backs,” Curtin said. “So our outside backs played a pass to the opposite center back. Only about 3-4 times during the game. But in those 3-4 times, it kills their pressure, it kills the life out of them. “It happened in the D.C. game a lot, too. Where now it was quite simply better, and we’re a little more patient playing these 25-30 yard diagonal balls where teams think they have you pressed and squeezed in, but it just opens up the whole game. And a lot of them have come from our outside backs not rushing forward and getting baited into turnovers, and just playing backwards to our center backs who are just 10 yards deeper than before. “Having our center backs drop just 10 yards deeper — and this is when we have the ball and we’ve finally won it — what that does now, instead of Wright-Phillips having to run 15 yards to start their initial pressure, he has to run an extra 10. And it’s also more time for our center backs on the ball to make the decision. So it’s less rushed. And that’s what Red Bull wants to do, is rush the hell out of you. “If you can make [strikers] have to do it over and over again, that can kill them. And then obviously having Haris in there to play the smart pass, to calm us down, to play a long clipped diagonal that makes them have to run again. Lloyd Sam didn’t want to do it over and over again. Neagle didn’t want to do it over and over again. Mullins wants to stand between the center backs. So you catch them in between, and they don’t really want to do the defending. “Where we got caught a bunch at the end of last year and the beginning of this year [was] with two fullbacks up the field,” he continued. “Now you’re in a fire drill with two center backs trying to put out a fire. And you know what Toronto is going to to do you with Giovinco and Jozy [Altidore]. So we always have three back now, as a general rule. So if Gaddis or Rosenberry is forward, Fabi stays with the two center backs. So it’s never both outside backs all the way up in the 18 like you see Columbus do. A persistent criticism of Medunjanin is that he lacks the speed and agility to defend in MLS’s high-octane environments. Is it simply that the Bosnian doesn’t pass the eye test, or is he really a limited defender? As his partnership with Ale Bedoya has developed, Medunjanin has found himself in the right spots more often than not. “He’ll tell you,” Curtin said, “he’s not [former Chelsea holding midfielder/destroyer Claude] Makelele, he’s not [current Chelsea holding midfielder/destroyer N’golo] Kante, he’s not going to run around and win balls, and he knows that. I’ve never met a player that knows exactly what his strengths and weaknesses are more than Haris; he’ll just tell you. “Defensively, he has an engine to run. He can run forever. It’s more like a diesel though, not for a quick change of direction. Once he gets going, he covers the most ground, statistically, on a regular basis. It’s usually him, occasionally Fabinho as an outside back, they cover the most ground with the data that comes back to us. It’s not that he doesn’t run, it’s that the quickness isn’t his forte. “We’ve worked a lot now, starting in particular with the LA game, between Haris and Bedoya, just really sliding a little bit more together, because a lot of times when one would get pulled out to the sidelines, the other one wouldn’t slide and be protecting the two center backs, or vice versa. If Bedoya would get pulled out, Haris was kind of slow to slide. And now they’ve gotten a much better understanding of each other. “Unfortunately, we lost a lot of time in the preseason because Roland wasn’t fit, and I had to tweak. But Bedoya was out of position at the 10, and we lost a lot of reps with him. Doesn’t mean he can’t play at the 10, that’s another thing that gets exaggerated. Watch the game against Toronto with Bedoya at the 10 and tell me he can’t play there. There have also been adjustments in how the Union press from the front. Against Montreal, they were persistently undone by Ambroise Oyongo on the left flank. Whenever a Union winger stepped over to pressure from a wide angle, the Impact moved the ball to Oyongo, leaving Ray Gaddis lost in space and caught between stepping to Oyongo or monitoring Nacho Piatti. “The change there is: Our wingers, now, they’re not flying out to the center backs,” Curtin said. “And I think part of that is just playing to everyone’s strengths and weaknesses, the whole group. Where we would previously have Pontius or Ilsinho or Fafa [Picault] or whoever run to the other team’s center backs and it would start this domino effect where they would get it out to their outside back and now Haris is scrambling, and Bedoya is scrambling, and we’re putting out a fire, it’s much more organized now. “Our wingers are staying, we’re getting pressure — part of it is all the work C.J. does — but our number 10 and our number 9 are the ones that pressure the center backs, and that keeps Haris and Bedoya home. Also, our wingers are pinching in more to help. If the ball is on the left-hand side our opposite side winger is pinched all the way over to the middle. If they’re going to beat us, they’ve got to hit an 80 yard ball over us and by then we can slide. According to Curtin, so much of the team’s defense comes down to how Sapong leads the line. “[The attacking midfielder] plays off of C.J. Let’s say the ball goes to the other team’s right center back, C.J. is instructed to close him down. Roland is in the passing lane. If it does somehow go back to the other center back, then Roland would slide to him and C.J. would drop into the 10 role. “So they’re almost on a rope together. You don’t want them flat, you don’t want them completely flat, where just one pass eliminates both of them. So it’s almost like they’re switching from the 9 to the 10. And they’re instructed to make it as predictable as possible for the guys behind them. Does it always work perfectly? Absolutely not. “But the general idea is that we want pressure to the other team to come from our 9 and 10. And we want them to force the opposition into playing a straight pass, not an angled pass, just because straight passes are so predictable and easy for defenders to defend. “So with our 10 and our 9, if they can put pressure on the center backs, that puts our wingers somewhere in the passing lane between the center back and the outside back. So you’re not man-marking the other team’s outside backs, for sure. If there are instances now where you’ll see, if the ball does get to their outside back, you’re seeing a recovery sprint from Fafa and Chris to get to their outside back. So that’s not leaving Ray and Fabi and Keegan in that no-man’s land where they have to make up 25-30 yards and they’re flying out there all or nothing. None of this is meant to be an argument for or against Jim Curtin as a coach. Instead, it is meant to bridge the gap between Earnie Stewart saying, “I see what [the coaches] do every single day, what I ask them to do every single day” and the team’s performances. The 4-2-3-1 is here to stay. But so are the 4-3-3 and the 4-1-4-1, which are merely different ways for three midfielders and three attackers to settle into defensive positions. Lift the hood on that shape, though, and it is clear that the Union have been changing and evolving as the season has progressed. Whether that evolution will lead to greater success is clearly yet to be determined, but it seems important at this stage to provide this concrete evidence that it is occurring. Given the internal storm Curtin has guided his team through, this is not a revelation. But Jim Curtin may yet be a very good tactician as well. But it may benefit the club and its fans to find out what he can do in a stable environment. I think I heard dozens of staunch 3 in the back supports explode in joy over this comment. You could replace Haris with Vincent and I would still be nodding my head. I like everything about this article. Does it settle everything in my mind? No. But it gives me confidence that Stewart and Curtin aren’t merely spouting platitudes to placate the masses. This was fascinating to read and very insightful into the inner workings of the U’s tactics so far. Great job and thanks. Really this is just conformation of what they have done on the field in this unbeaten streak. Jim has shown he can adapt tactically. I guess for me it seemed to take too long. I hope he can keep it going. What would really cement a better feeling about Curtin, was if he were to actually rotate players this weekend. And I agree, I’m also not settled yet on everything. ….and yes I feel the expletive is needed. There is a ton to digest here and luckily a weekend to do it before next week’s news cycle renders it back burner content. this much… ilsinho as CAM and Haris as regista is tasty. +1 – Field your best 11, then its up to Jim to make them play together. – Our outside backs are staying home more now. The opporate on a fulcum, when one advances the other stays with the CB’s. -Against Red Bull, when we got possession our CB’s would drop deeper to give them more time and stretch the RB defense. – We try to switch the field from time to time in the back to make the defense run more. -Alberg not being fit almost destroyed the whole season. -When CJ presses a CB, if that CB passes to his partner, the 10 takes that guy while CJ drops back into the 10 spot temporarily. I harp on Alberg all the time, but honestly, if Alberg’s lack of fitness nearly destroyed the whole season, that’s a black mark on both Curtin and Stewart. Alberg certainly has talent, but his proper position is as a second striker — on a team that plays with one. He doesn’t have a place on this squad. I cannot understand why our team was held up by him. I’m not even sure he belongs in the 18, never mind in the starting XI. Now getting thrown off the plan by Yaro’s injury — that makes much more sense. I like the idea of bringing in Medujnanin as a way to break the high press that everyone tries to play now. That 30 yard pass is good to relieve pressure if CJ can hold it up, but I’d love to see the 35 yard pass into space behind defenders even more. Fafa can run onto those balls (as we saw against Houston), but how does CJ fit into that? It seems like the most logical approach when half the league spends a ton to do what everyone else in Europe does against the big clubs – be tactically tight and conservative in defense and look to break quickly on the counter. So is Route 1 the answer for the Union? I don’t know – guys like Ilsinho don’t seem to fit that gameplan either. Work in progress I guess, but for Pete’s sake — DON’T FIRE JIM!! It’s not that Route 1 is the answer to beating a press, but the occasional Route 1 and more importantly the THREAT of Route 1 is the key. Teams could key in on us (similarly to what happened to the USMNT in the last WC) because we had no speed threat up top except CJ who for whatever reason isn’t the most adapt at making a run that stretches and beats a CB. Route 1 is an acceptable tactic just as much as parking the bus. All depends on who you are playing and what you may need to accomplish. One part of what I mean about there being a lot to digest in this article: regarding Route 1 soccer as tactic to back off the other team’s press or keep the other team honest in order to create some space on the field and Route 1 as in the goalkeeper almost constantly being given the ball as an outlet but the #3,4,5,or 6 and him belting it upfield (Richie Marquez guilty too) which occurs WAY too much. This is not emerging sophisticated soccer…this is Route 1 as offensive identity and is not okay because fear of a mistake. People laud the shot stopping ability of Andre and I do too but EVERYTHING begins with the goalie’s ability to handle pressure and the ball and distribute. This is one of the countless argument ‘eurosnobs’ or purists make against the MLS version of the game. CJ fits in because when he checks back and pulls the CBs back with him, Fafa is sneaking over to burn them over the top. Route 1 can be awesome, but using it too much makes it too easy to defend. What a great article. Learning all the little things like this make watching a game so much more enjoyable, at least for a tactical nerd like me. Personally, i would have loved this article 2-3 weeks ago. It would have calmed me down, given me a little more confidence in sarnie/jim. Nevertheless i very much appreciate this. I know PSP was looking for suggestions earlier, if we could get these interviews filmed, that would be amazing every now and then! Great article but I feel like it’s almost to telling. Talk about a scouting report for your opponents. Needless to say it puts to rest that they don’t know how to use their personal. Also there is more to come if they can ever get some key players healthy. Does it leave open that they know how to use their personnel but still weren’t able to unlock that successfully for the first 8 matches? A professional manager could tell you all of this after a session of watching film. I’m sure that’s true it’s just that I’m so use to never getting much of the game plan….from any sport. This was what I needed in this traffic jam. Good insights. Unbelievable Haris runs the most in training, haha. Not in training – he’s talking about data from the games. He covers a ton of ground in the same way Michael Bradley does. This is a very good read! I’m not the most tactically minded guy, so this is just awesome! Knowing that the process sometimes takes​ longer than expected to show results isn’t a surprise​. Getting the account of what goes into making it happen is a surprise. Very candid from the manager. Also if Alderg came into preseason out of shape, it’s no surprise he has not seen the field. Adam….you do an incredible job. Thank you. Thank you, Adam. Much obliged. It is a compliment to you that the club allowed you the interview and the story. It is a compliment to PSP writers and readers as a whole, as well. And thank you, PSP. Thank you, Jim Curtain and the Union. The analysis , while engaging and kind of fun, is a little like angels dancing on the head of a pin. This team is not so good, and the ascribed tactics and results thereof are pretty fanciful at best. Poor players , of which there are many in the whole league as well as on the Union, do not move in this video game like manner ever, I think. The team will revert back to the mean soon enough, especially if the tactics are as complex as they seem to be for an uncomplicated team. I am sure Adam knows that the Italian School views tactics in a somewhat different light. Sounds like they are simplifying the responsibilities. It’s good to see this team finally perform the way they’re capable and get rewarded for it. The big test will be how they respond when teams come in with a game plan. We’ll see how Curtin adjusts. I still say this team needs a skill upgrade in proven difference makers. The interesting thing is that Ilsinho is difficult to game plan for as the #10. I hope he owns the spot. Good read to educate the unwashed masses. Well done. Nothing ground breaking from Curtin’s tactical comments here. For perspective, Similar work being done with our U15-18 teams who implement this most popular of shapes. Fantastic article and interview, Adam. You’ve outdone yourself with this one.